Registered account. Did everything according to instructions, reinstalled twice. But the problem persists. C:\Program Files (x86)\MSBuild\Xamarin\Android\Xamarin.Android.Common.targets(182,5): mandroid error XA9005: User code size, 430080 bytes, is larger than 65536 and requires aВ IndieВ (or higher) License. C:\Program Files (x86)\MSBuild\Xamarin\Android\Xamarin.Android.Common.targets(182,5): mandroid error XA9006: Using type `System.Reflection.Assembly` requiresВ IndieВ (or higher) License. 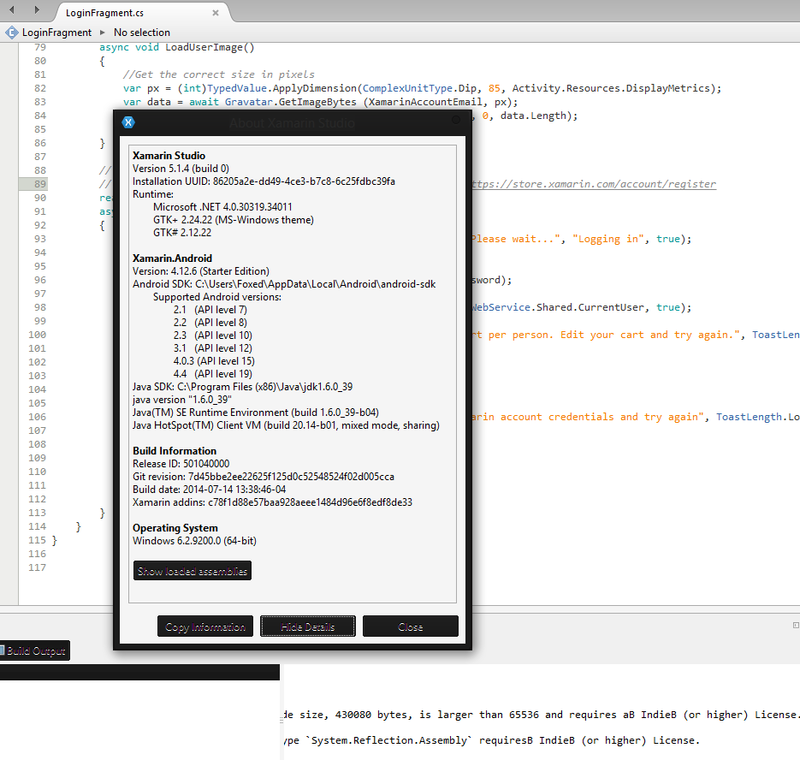 Done building target "_ScanAssemblies" in project "XamarinStore.Droid.csproj" -- FAILED. Done building project "XamarinStore.Droid.csproj" -- FAILED. C:\Program Files (x86)\MSBuild\Xamarin\Android\Xamarin.Android.Common.targets(182,5): mandroid error XA9005: User code size, 430080 bytes, is larger than 65536 and requires aВ IndieВ (or higher) License. C:\Program Files (x86)\MSBuild\Xamarin\Android\Xamarin.Android.Common.targets(182,5): mandroid error XA9006: Using type System.Reflection.Assembly requiresВ IndieВ (or higher) License. Well I hate to rehash what the error is saying but you have to have an Indie or higher license. For mine, I started my free trial; that will suffice to get the shirt. I wrote that my license is not enough. Although as everyone says should be enough either. If you don't have an Indie or higher license, then you need to start a trial license. That will allow you to build the project. Contact [email protected] They can take care of you. I'm having the same problem. Everytime I build the XamarinStore project, it keeps getting error without any trial notify window. This is terrible. I don't even have an option to manual start a trial license. Same here. Installed Xamarin on 2 windows 8 pc and there is no Trial windows appearing even after "build is too big" error. Open Xamarin studio and in top right(Blue Bar) There is an Option to "Start Trial". Click that. Please any one suggest What i am doing? ?